Shades of Stockhausen and Galina Ustvolskaya, but with that distinctive Asahara minimalist touch. The 60 minute span seems to pass in a quarter of the time. Following the runaway success of her re-released 1974 album "Saint Agnes Fountain", we're pleased and proud to present a new full length piece by this radical and farsighted composer. This is a 60 minute work which Masayo has created from source material played by Martin and Philip. Archer's atmospheric and varied improvisation has been orchestrated by Masayo with piano samples which are by turns agressively insistent and delicately shaded. Shades of Stockhausen and Galina Ustvolskaya to our ears, but with that distinctive Asahara minimalist touch. The 60 minute span seems to pass in a quarter of the time. It's a badly kept secret that Masayo Asahara is no more than a fevered outpouring of Martin Archer's already overheated imagination. In a pathetic attempt to sell just a few more CDs of creative music, he occasionally adopts this alter ego in the vain hope that more people will want to buy a CD by a mysterious Japanese woman than by an ornery Englishman. But surely, that could never be, could it? 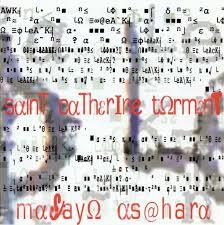 Saint Catherine Torment was composed and by Martin Archer in February 2004. "On this, Martin Archer continues the perpetuation of his Japanese female alter-ego hoax – and ascribes unto her this hour-long composition called St Catherine Torment. Philip Thomas played the prepared piano, Martin Archer played the violectronic, and the resulting bad-tempered and fragmented electro-acoustic composition was edited by Asahara. It starts with piano plucking from the lower register, almost resembling Cecil Taylor in a bad mood with both hands tied behind his back; but since the work is dedicated to Stockhausen, mentor of many, then perhaps Klavierstucke is a more appropriate model. There's added percussion and very spare electronic instrumentation, phweeps and groans. By index point 8, it's become something more of a cosmic and echoey electronic workout for the violin instrument-thing. Don't except Tangerine Dream, though – this is modernistic, atonal and cerebral music, a good effort to deliver a convincing update on the Darmstadt school. Soon, the plunking and jamming is really 'in the groove', combining piano with live electronics in a striking mixture. In fact, the musical tunnel we're led down here is very narrow indeed. It obstinately ploughs a single furrow and relentlessly denies any form of enjoyment, for the most part. It's a long set of very insistent, nagging and monotonous music, which could easily drive you up the wall on a bad day, but I have to admit I do like this rather curmudgeonly side of Archer than his more altruistic, friendly approach. Not that we often see the latter.